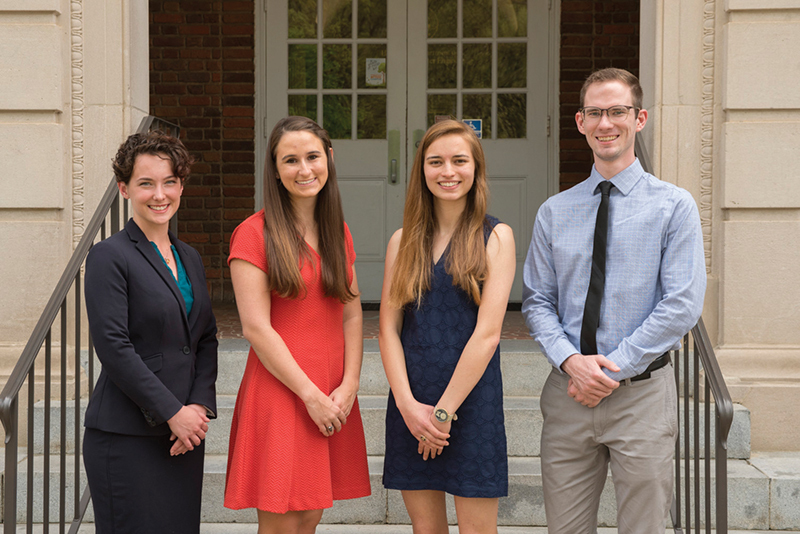 This year’s crop of NSF Graduate Research Fellows included (from left) Jacqueline Rohde, Lauren Pruett, Lauren Gambill and John Sherwood. Not pictured are Sarah Donaher, Kylie Gomes, Shyla Kupis and Brandt Ruszkiewicz. One of the nation’s top honors for graduate students is going to eight from Clemson, putting them in the same club as several Nobel Prize winners, Google co-founder Sergey Brin and “Freakonomics” co-author Steven Levitt. The students are receiving Graduate Research Fellowships from the National Science Foundation. A fellowship is recognition that the recipient shows high promise in becoming a knowledge expert who can contribute significantly to research, teaching and innovations in science and engineering. Each fellow receives a $34,000 annual stipend and a $12,000 cost-of-education allowance. The money supports graduate study that leads to a research-based master’s or doctoral degree in science and engineering. The NSF received more than 13,000 applications for the 2017 competition and made 2,000 award offers to students from 449 institutions. This year’s crop of Graduate Research Fellowships underscores the success of Clemson’s Grand Challenges Scholars Program. Two students who received fellowships and one student who received an honorable mention are in the inaugural graduating class of Grand Challenge Scholars at Clemson. In 2014, Clemson became the 19th engineering school in the nation to offer a Grand Challenges Scholars Program, which is aimed at helping students prepare to become world-changing engineers. Sarah Donaher, senior, environmental engineering major and Grand Challenge Scholar. Lauren Gambill, senior, biochemistry major. Kylie Gomes, graduate student, industrial engineering. Shyla Kupis, graduate student, environmental engineering. Lauren Pruett, senior, bioengineering major. Jacqueline Rohde, senior, bioengineering major and Grand Challenge Scholar. Brandt Ruszkiewicz, graduate student, automotive engineering. John Sherwood, graduate student, environmental engineering. Travelers Summer-Fall 2017 You Brought Your Daughters!